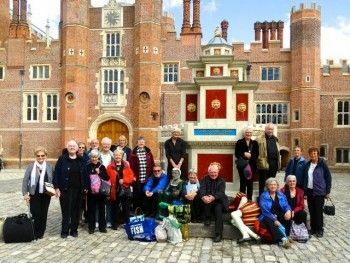 A group of senior citizens from West Cumbria earned the chance to play at Hampton Court this month thanks to their persuasive group co-ordinator, Bridget Hilton. 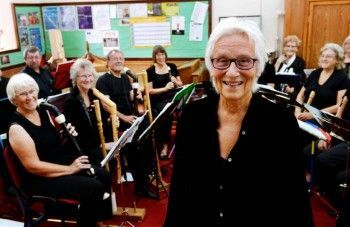 Bridget, a retired music and French teacher, runs the Cockermouth U3A Early Music Group, Alte Musik. She was struck by the lack of music on a visit to Hampton Court earlier this year. On the way out she noticed there were some children going into perform and thought ‘If they can, we can’. “I said ‘Yes, I have’. “He asked: ‘Who are you, what’s your name? “I said ‘Bridget, Lady Bridget of Cumberland’.” And she put her request forward, which was agreed. The Cockermouth U3A group was invited to play in The Cartoon Gallery of the Baroque Palace at Hampton Court on Friday 18th September. Thirty players and partners travelled down to the capital, thanks to funding from the Abbeyfield Carlisle Over 55 Fund, which covered the cost of the bus. The group was set up 10 years ago by Bridget, who retired from Yorkshire. She said: “When I moved up here, I had no one to play with. I wanted to find four or five people that might like to play together and so I advertised through the U3A and it started with five of us playing together every week. They have played at The Georgian Festival and Cockermouth Live! but Hampton Court is undoubtedly their biggest date and they practiced very hard for their half hour slot. 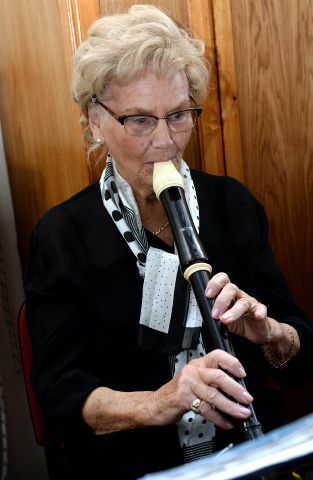 The oldest member, Margery Brunskill, 91, plays the tenor recorder. When she joined the group several years ago, she had never played an instrument, but was looking for a means to be able to prolong her active musical life. She slowly learned to play the tenor recorder through the accessibility of the Early Music and now values her weekly practice sessions as giving her something to live for.